Using the daily data collected through GeoPoll’s Media Measurement Service, GeoPoll has analyzed the top radio stations in Rwanda for the month of May from May 1st – May 13th. We examined both ratings* and share** for the top stations in Rwanda. We will compare these ratings to those from exactly a month ago, April 1-13th, also published on the GeoPoll blog. The week of April 7th was a week of national mourning in Rwanda for the Rwanda Genocide, during which time many radio stations play primarily religious music. Because of this change in programming, we wanted to compare listenership for the same two weeks in May. The below chart shows the average ratings for the top 10 stations during the day from 6am to 10pm. 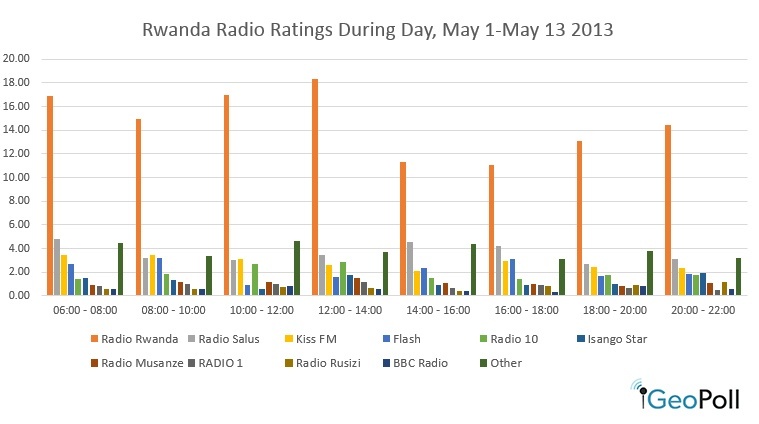 As the chart shows, Radio Rwanda has high listenership across the market with high ratings mostly in the morning between 0600 and 1200hrs. Radio Salus and Kiss FM have similar ratings in the morning. Radio 10 peaks mid-morning till midday while Radio Salus peaks between 1000 to 1200hrs. GeoPoll also examined average share from May 1st to May 13th. GeoPoll found that Radio Rwanda had an average share of over 40%, followed by Radio Salus and Kiss FM. Isango Star and Radio Musanze maintain a close share, at 3% – 4%. Compared to the share from the 1-13th of April, the top three stations have stayed the same, with Radio Salus and Kiss FM switching places. 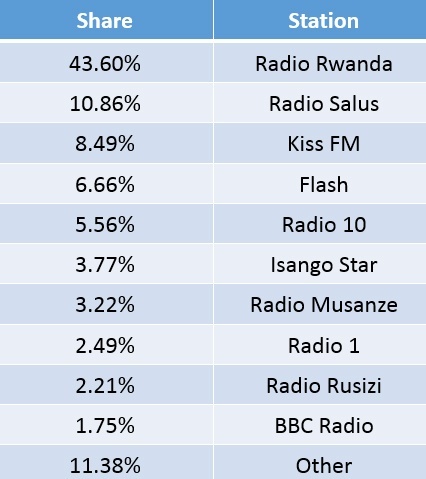 In April we found that Radio Rwanda had a slightly higher share than May, at 49%, and Kiss FM had a higher share, 10%, than Radio Salus, 7%. The remainder of the top stations had similar share in April and May, with one notable exception. Ijwi Ry’ibyiringiro, which had a share of 7% from April 1-13th, making it the fourth most popular station during that time, has dropped out of the top stations. This could be explained by the week of national mourning from April 7th– 13th, as this station is a religious station so may have had more listeners due to the memorial week.